From 1872 to 1876 the North American Boundary Commission mapped and marked the 49th parallel between Canada and the United States, in conjunction with the North West Mounted Police. The purpose of the Boundary Commission and the NWMP was to establish the international boundary and enforce British law among the whiskey traders, wolfers, bandits and outlaws of the Canadian West. Among the hazards they faced were weather, bugs, skittish horses and rowdy locals. 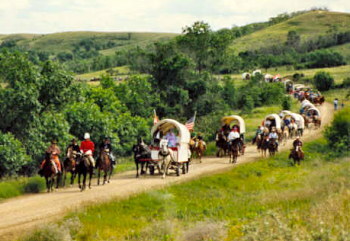 In 1992 Ray Foxworthy and his sons Kyle and Ryan joined the wagon train re-enacting this historic journey. The intent of the wagon train was to commemorate the 125th anniversary of the founding of the NWMP, now the RCMP, and their influence on Canada's west. As much as possible they traveled the route of those earlier police and surveyors, seeing part of the prairie not readily accessible, to recreate the march west from Dufferin, (now Emerson) Manitoba, to Fort McLeod, Alberta. The commemoration took longer than the original trek; eight years from 1991 to 1999. The wagon train and outriders only traveled one hundred miles a year, during one week each summer, which was all the time most people could take from work. Along the way they had to contend with storms, insects, runaway horses and rowdy locals. Ray, Kyle, and Ryan joined the trek at Sourisford, MB, where the wagons forded the Souris river and rolled up out of the valley. Ray's sister and her husband , Neale Daniels were also on the trip, in fact Neale would be leading the group. "Neale knew where you were supposed to as opposed to those people who only thought they knew where you were supposed to go!" The RCMP sent a representative, dressed in a replica of a NWMP uniform, to ride beside the civilian leader. Wagons and outriders joined along the way. 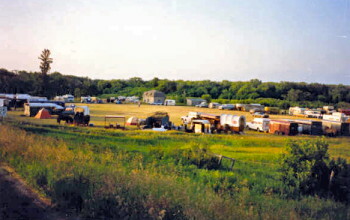 The 1992 trip eventually had thirty-one wagons and over two hundred people. From Emerson to Sourisford the wagon train had suffered from snow and rain. They'd frozen and gotten stuck. As the Foxworthy family discovered, nature wasn't done yet. Funnel shaped clouds formed the first day, making everyone uneasy. The flags were handed over at the Saskatchewan-Manitoba border. 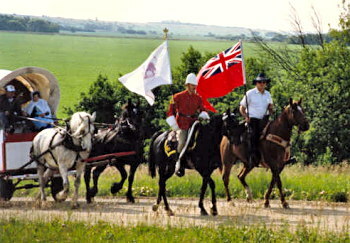 The honorary leader for the next leg was an eighty-two year old Saskatchewan lady on her Arabian mare. She was adamant that the train was going no faster than a walk. Then the lightening storm blew in. "That's when the ride turned into a rodeo!" Ray remembers. Any horses not bombproof gave their riders a hard time. Runaway wagons almost tipped over. Participants decided to heck with the eighty-two year old lady and her Arabian: they made for camp at all possible speed. Camp was chaos. Fifteen year old Kyle Foxworthy was holding two panicky horses, a set of reins in each hand. Ray told him to let them go before they pulled him apart like a wishbone. The horses ran wildly into a ravine where they sheltered with a bunch of other runaways. Later they were found and led back to camp. Eventually the chaos simmered down. Participants were supposed to go in buses to retrieve trailers, trucks etc from the starting point. The buses didn't show, "We found out what it was like to be a cow going to market." Ray remembers. "We got rides in cattle trucks. Everybody worried about the horses so the drivers of the cattle trucks weren't wasting much time." The next day started out calm and hot, one of those quiet days when people were lulled into an 'asleep at the wheel' mood. Until the Mountie's horse bucked. Then the mood became "What's going on?" They'd been riding through long prairie grass when something on the ground spooked the horse. Off went the Mountie and disappeared into that tabletop high grass. There was no movement. Drivers and riders gathered round, staring horrified at the spot. After a long, long wait, an arm in red serge rose from the grass and a white glove waved weakly back and forth. Relief, the Mountie was alive, dirty but fine. Now to recover his horse. The horse, deciding he'd had enough of this for the day, had run into nearby bushes. Some 'cowboys' started chasing it. They only succeeded in chasing it further into the bush. Ray's request that they let the horse be was met with such comments as "Leave them, they'll get him." "They'd likely get him in Alberta." Ray states. When the other riders backed off, he rode up to the edge of the thicket. 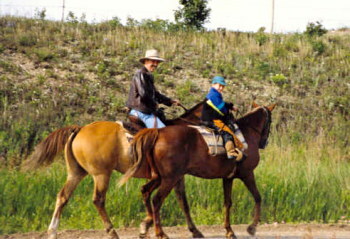 As the frightened horse tried to go to the right, Ray's twenty-seven year old, experienced cowpony headed him off. To the left, same reaction. Gradually the errant horse realized it had nothing to fear and stopped. Ray and his horse got close, he reached out and grabbed the reins and the runaway went peacefully with him. That night they camped on the wild prairie. A good breeze kept the mosquitoes, sometimes known as Manitoba's provincial birds, away. As Ray sums it up, "On the flat open prairie with a wind, you're fine. In the trees, you're lunch." Other pesky intruders were local weekend 'cowboys' who'd come down to party with the wagon train. They'd party all night long. The wagon train people who'd been on the trail all day, had to get up the next day to do it all again. The locals could just go home and rest. Of course, it wasn't all storms and bugs. 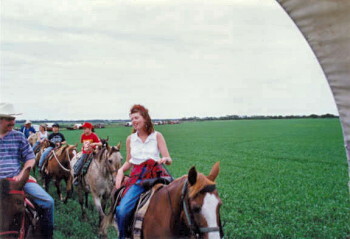 The ride was mostly on unbroken prairie. The route was actually on the original trail in some places, and that original trail was still visible. It's loosely followed by highways #3 and #23. The Commission established the boundary and decided where to locate the forts. Rock foundations and bits of rotten logs from those forts were still there. There were old teepee rings on the tops of hills. It was Canadian history come to life. Ray's sons enjoyed it. Kyle was riding Sally Blackburn, one of the famous Blackburn quarter horses. Sally was a horse that always wanted to spend more time on two legs than on four. "It's a good thing Kyle's as good a rider as he is," Ray notes, "because Sally would never stop rearing. " Ryan's horse, Blaze, a young quarter horse just took things in stride. And Ray? "I realized I'd spent too much time in vehicles the last few years and not enough on horses. When I was a child, I was GONNA be a cowboy. As a young adult, I rode as much as I could possibly ride. I was a WANNA-Be cowboy. When I got older I realized I was NEVER-GONNA-Be a cowboy. From Gonna-Be, to Wanna-Be, to Never-Gonna-Be, it's a sad progression. But, I realized on the Boundary Ride, I'd have to give up a dream." "Lots of people in the world are told, 'You're born one hundred years too late'. I always felt I was born one hundred years too late. I always wanted to experience what the pioneers went through. The Boundary Ride was a way of doing that." Ironically, at the very end of the commemorative ride, the wagon trains and outriders weren't allowed into two famous forts, Fort Walsh and Fort McLeod. Officials worried that the horses might dirty the streets. They didn't want tourists to step in horse dung, or even know what it looks like. That's peculiar, because, if not for the North West Mounted Police and their horses, neither fort would exist. Come to think of it, those first NWMP riders got much the same reception, from the outlaws and whiskey traders. They weren't welcomed either. Some things never change.